Our signature tour begins at the iconic Grand Central Market and features the highlights of Downtown Los Angeles. Grand Park, Broadway’s classic theaters, The Broad and MOCA Art Museums, Bradbury Building, Music Center, Disney Concert Hall, Chinatown, Union Station, and City Hall are just a few of the narrated stops. We break at Olvera Street, where you’ll get sometime to wander L.A.’s oldest neighborhood and marketplace, on your own. This tour is for visitors looking to see the top 10 tourist destinations, and a few hidden gems, in Downtown L.A. Starting at Grand Central Market, you will explore the movie palaces of Broadway and the nightlife of Spring Street. Then head over to Olivera Street, the original camp of the Spanish settlers who founded Los Angeles. You'll see Union Station, Chinatown, and City Hall. You will meander through Grand Park, up to the cultural landmarks of Los Angeles, Disney Hall and the Broad Museum. Finally, you will stop by the magnificent Central Library and Pershing Square. 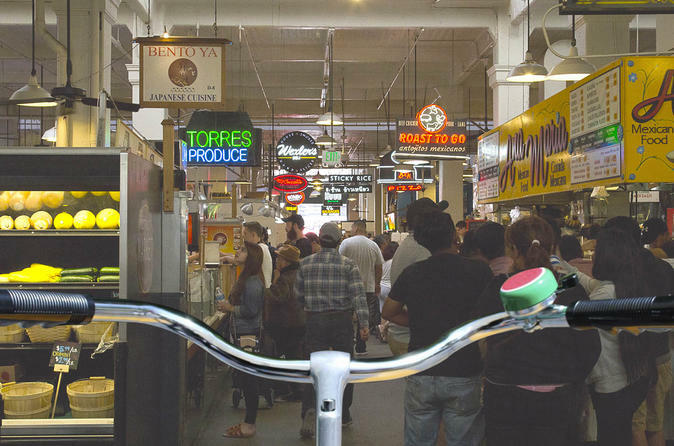 Landing back at Grand Central Market, you will have earned the culinary delights that await. We use 8-speed Pure Cycles, Bell Helmets and all our guides are Red Cross-certified. Your tour is appropriate for the casual bike rider because you ride slow and stop often; however, you will get a good 8-mile bike ride. With approximately 10 stops, you will hear history, movie lore and true crime tidbits not found in any guidebook.